Things To Do Near A Famosa Water Theme Park Sdn. Bhd. A Famosa Water Theme Park Sdn. Bhd. Find hotel near A Famosa Water Theme Park .. 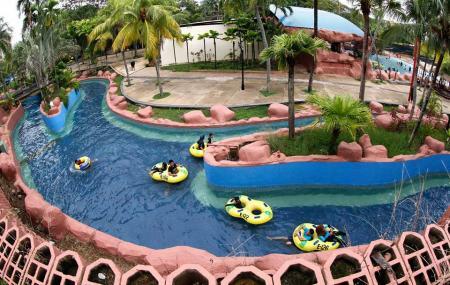 The first theme park ever to be built on the land was Water Theme Park in A'Famosa, Malaysia. Finished its construction in the year 1996, A’Famosa Resort had opened its gates to thousands of tourists to the resort ever since. The next highlight finished in the year of 2001 which was the Safari Wonderland. The Safari was one of its kind back then where the concept of animals roaming freely and talented animals performing tricks became one of the regions “a must-to-visit.” One year later, in 2002 A’Famosa Resort introduced another highlight which was the Old West. Live up to its name, the Cowboy Town was the visionary of the founder to relive the era of the Wild Wild West. Personalize your visit to the city by chalking out a plan using Alor Gajah trip planner. Add comfortable hotels to your plan, choose from the recommended hotels in Alor Gajah like Alor Gajah Homestay, Y&z Hotel and Nawawi's Cottage. Curated Alor Gajah vacation packages await! Book the best ones and start turning your dream into reality.Discover various ways for how to reach Alor Gajah and complete the booking by choosing your mode of transport. How to Reach A Famosa Water Theme Park Sdn. Bhd. Love this? Explore the entire list of places to visit in Alor Gajah before you plan your trip. Fancy a good night's sleep after a tiring day? Check out where to stay in Alor Gajah and book an accommodation of your choice. Things to Know Before Visiting A Famosa Water Theme Park Sdn. Bhd. How popular is A Famosa Water Theme Park Sdn. Bhd.? Most popular time to visit A Famosa Water Theme Park Sdn. Bhd. Average time spent at A Famosa Water Theme Park Sdn. Bhd. People usually take around 30 Minutes to see A Famosa Water Theme Park Sdn. Bhd. How to get to A Famosa Water Theme Park Sdn. Bhd. 92.29% of people prefer to travel by car while visiting A Famosa Water Theme Park Sdn. Bhd. Attractions normally visited before or after visiting A Famosa Water Theme Park Sdn. Bhd. People normally club together Butterfly And Reptile Sanctuary and A'famosa Resort while planning their visit to A Famosa Water Theme Park Sdn. Bhd..
Nice experience, we went during weekdays, pretty much no queue. Tallest slide in South East asia is here. Place is pretty clean during our visit. No complaints here. Good experience overall.